Motorola comes from the combination of two words, 'motor' meaning car and 'ola' meaning sound. Motorola began making car radios in the 20s and 30s. They also made the walkie-talkie radios used by American GIs in the Second World War, so the link with radio phones was well established. Motorola experimented with cellular technology in the early 70s and produced some prototype mobile phones. However, it was not until 1983, that they produced a commercial version: the world's first hand portable mobile phone, the Motorola 8000X. It was a symbol of a new way of communicating and doing business. At the same time, the 8000X became a status symbol, with a price tag of £3000. Motorola made some ground breaking premium phones. The MicroTAC of 1989 was the first phone that did not resemble a house brick. For a time it was the world's most desirable business accessory. Motorola did it again in 1996 with the StarTAC, the world's smallest phone to date, which became a must-have gadget with a price tag of £1400. Motorola lost its leading position in the mobile phone industry in the 1990s. There were two important reasons for this. Firstly, Motorola failed to recognise the growing importance of digital. Possibly because of the firm's American origin. In the USA, analogue was the preferred system for many years after Europe was already on GSM. This mistake allowed Nokia to take the lead as the world's number one mobile supplier. Secondly Nokia phones were easier to use. The Scandinavian aptitude for good design with a human face was particularly suited to mobile phones. Not only did people prefer phones that were easy to use, operators preferred them too. If it was easy to find your friend's number in the mobile phone's address book, then you were much more likely to use the mobile to make the call. In the first few years of the new century Motorola continued to produce premium phones of innovative design. They had one final success in 2004 with the RAZR V3, which was almost a slim as credit card. Motorola have their own company history. 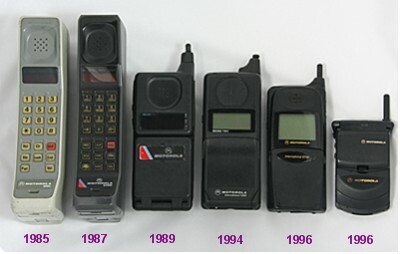 Have a look at Motorola timeline.